I was really excited to try out this foundation as it promises to be amazing; it claims to remove redness, remove dark circles and to brighten your complexion. To be honest I don't think it completely lives up to its selling points, but the foundation does feel really nice, soft and light on your skin. I have an issue with having dark circles under my eyes so I was hoping that this would slightly remove some of the darkness but it has not. The other issue I have with this foundation is the colour, I have brought the lightest shade (51 - light vanilla) and it still doesn't completely match my skin tone, which is quite disappointing. 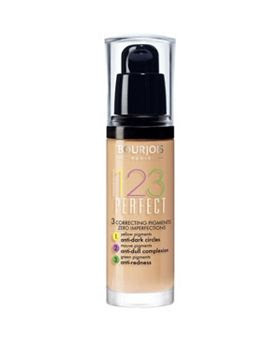 Overall I have quite mixed feelings with this foundation, and this isn't the first time I’ve been disappointed with a Bourjois foundation (I brought the Bourjois Bio Detox Organic Foundation and I have to say that is the worst foundation I have ever used!) Im going to “pan” this foundation just to see if I change my mind half way through (as I am known to do this!) but unfortunately I am pretty sure I haven’t found my new favourite foundation.